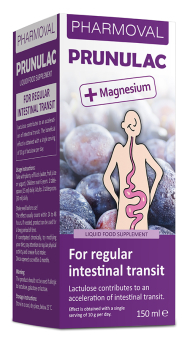 Prunulac is liquid food supplement for regular bowel movement with lactulose, prune extract and magnesium. For children over 3 and adults. The beneficial effect is obtained with a single serving of 10 g of lactulose per day. Take with plenty of fluids (water, fruit juice or yogurt). Children over 3 years: 1 tablespoon (15 ml) daily. Adults: 2 tablespoons (30 ml) daily. The effect usually occurs within 24 to 48 hours. If needed, product can be used for a long period of time. If constipated chronically, try modifying your diet, pay attention to regular physical activity and icrease fluid intake. The product should not be used if allergic to lactulose, galactose or lactose.